Technology has changed the way we work, shop, bank, meet others, and even order coffee. Personalized services and intelligent assistants help us navigate choices and make informed decisions in the office, in the car and at home. But despite how advancements like machine learning, big data, ubiquitous computing, and universal connectivity have forever changed these everyday interactions, our experiences with healthcare remains stuck in a disconnected, opaque and rigid past. In healthcare today, patients are forced into the same service structures, whether they are managing a chronic condition or have encountered an undiagnosed issue. Clinicians often don’t have access to useful patient data, which remains siloed within disparate sources. And as a society, we allocate healthcare resources without being able to evaluate their impact because we don’t link actions to outcomes. Aim is a concept of a service platform that sets the foundation for positive health outcomes by delivering better care experiences and new, flexible models of discovery, understanding, and intervention. 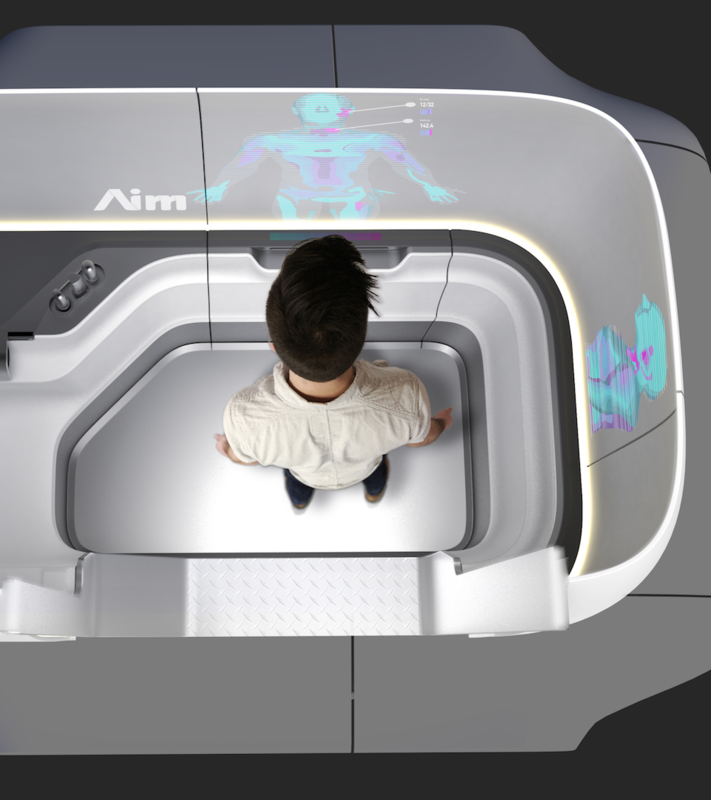 We called the concept Aim as a play on artificial intelligence and medicine, augmented interactions and mobility, but it is also a goal we should aspire to as we imagine, design and build a more integrated, effective and efficient healthcare. Our focus on quantity and cost of care rather than its value has resulted in an inflexible, rigid system full of gaps, tensions, and friction for patients, care organizations and society. Innovations get bolted on to the complex, inflexible system, solving one problem, yet often creating a myriad of other, even more complicated ones. Just look at electronic health records. To solve the interconnected problems in healthcare, we needed a system level approach. 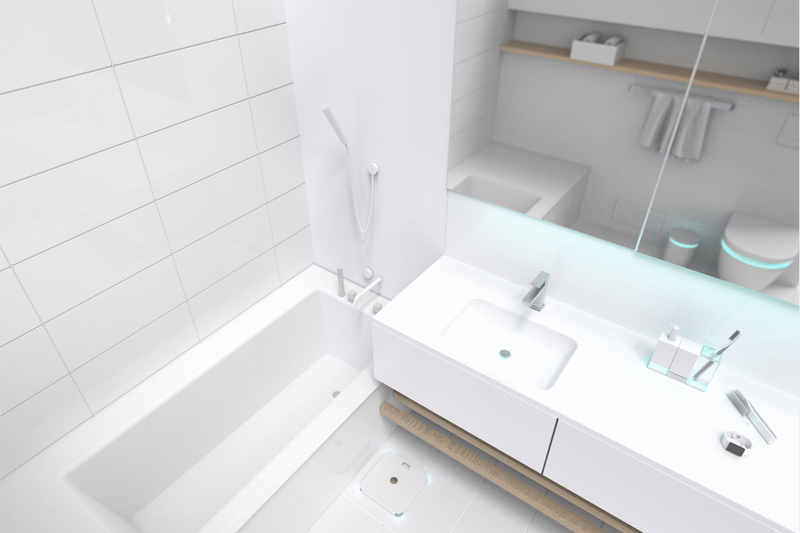 What is unique about the concept is less the individual components: a data platform, an autonomous vehicle, AI-powered diagnostics, some of which already exist, but how they connect and interact with each other in a system and experience that allows us to maximize value at the patient, provider and social level. Despite proliferation of connected devices and health apps, health data today is siloed and far from actionable. Aim is built on an integrated, multi-source data platform that facilitates action and eliminates blind spots for clinicians and care providers. 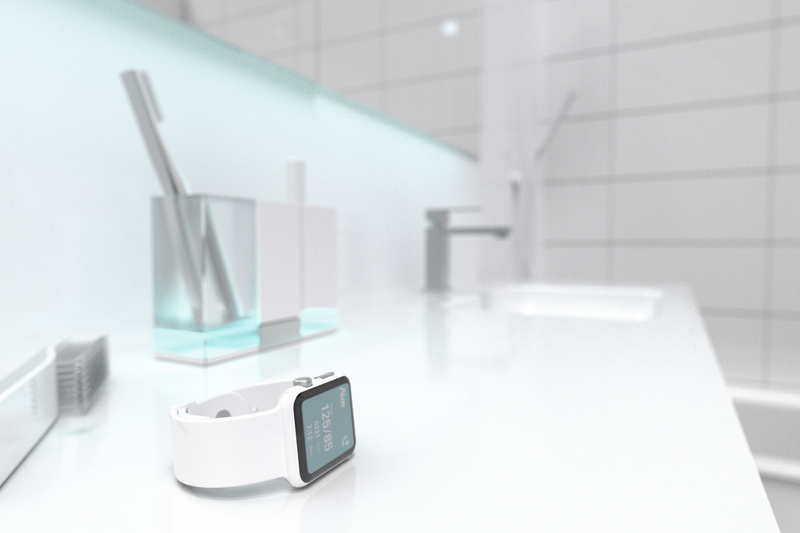 The service platform collects ambient data from an array of at-home, passive monitoring devices, without requiring patient action. 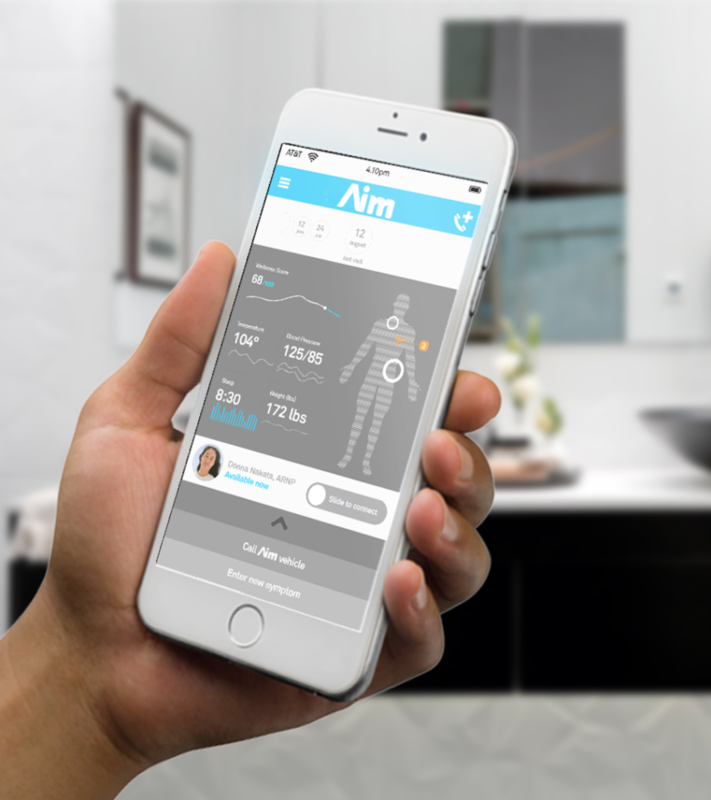 Aim’s open APIs allow a broad range of current and future healthcare-centered IoT devices to be integrated into the platform, addressing the core challenge of monitoring device interoperability and creating a unified, patient-owned health record. A dedicated home health hub and mobile app prompts and collects important qualitative data about how the person is feeling. Aim uses a conversational UI to include these patient comments, and registers changes in voice attributes to create a critical part of the physiological and emotional health data set. Healthcare today is structured to address all patient workflows in the exact same way despite the variability of care trajectories. 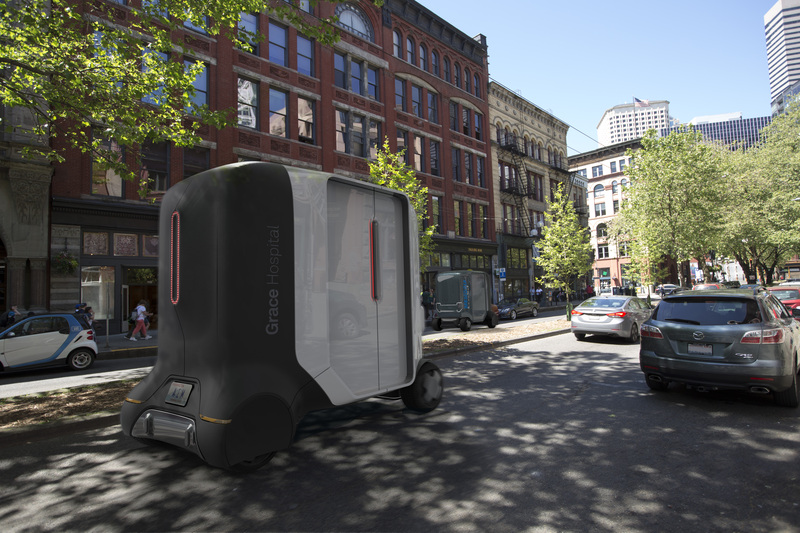 Aim uses advances in artificial intelligence and autonomous vehicles to deliver more precise assessments, and address specific healthcare needs as they come up. Aim’s self-driving clinic is optimized for self assessment with bridge diagnostics like thermography, imaging and breath analysis. 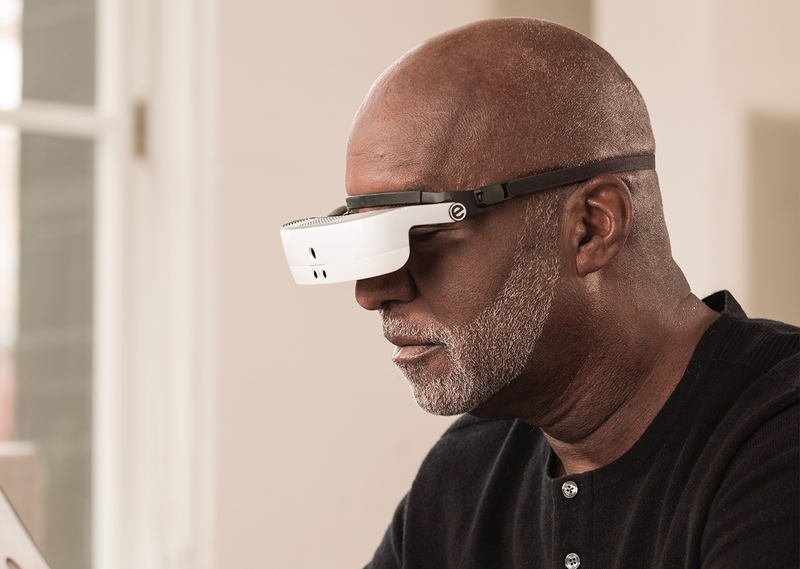 The unit features a built-in, pressure-sensitive scale to measure weight, BMI, balance, and posture; a seat providing an acoustic analysis of respiration and cardiac rhythm; and controlled lighting that facilitates assessment via image recognition. 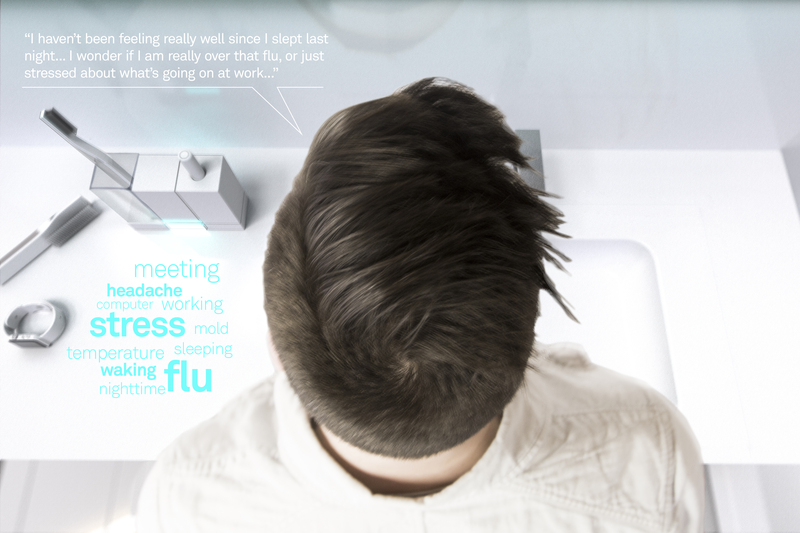 Surround displays provide AI-driven, real-time instructions to the patient. Aim allows patients to use simple interactions to share details about how they feel and interface with the bridge diagnostics. 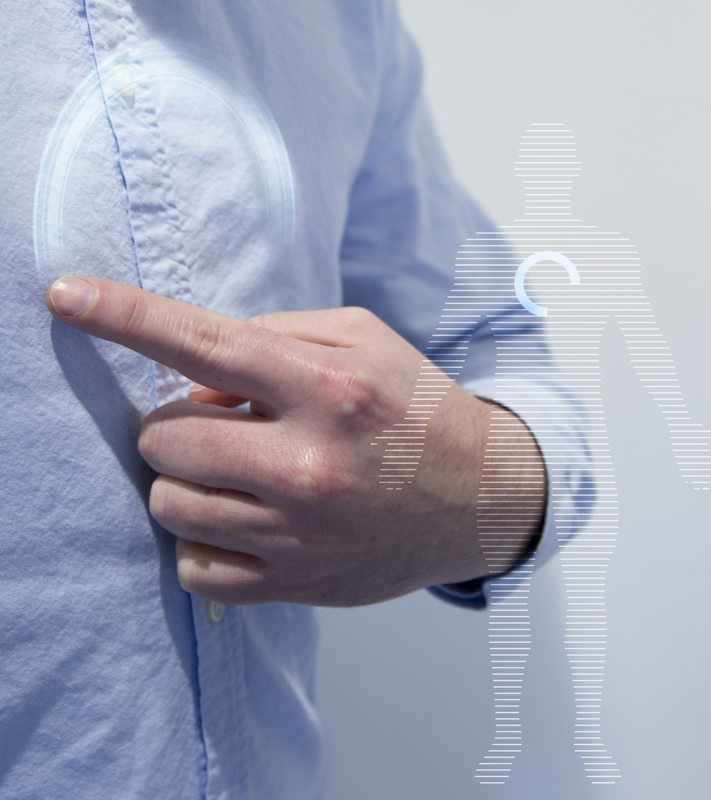 Motion sensors paired with “on-body” projections and augmented reality help the user call attention to symptoms. A highly visual summary of the Aim session helps the patient easily understand and act on the diagnosis. These insights stay with the patient via the Aim mobile app for a new level of continuity of care. The mission of Aim is to close the data, experience and logistical gaps between home and clinical environments. Our vision for a scalable, holistic concept of healthcare service delivery gives patients autonomy, while helping care organizations successfully triage cases, manage the burden on the system and allocate resources effectively. 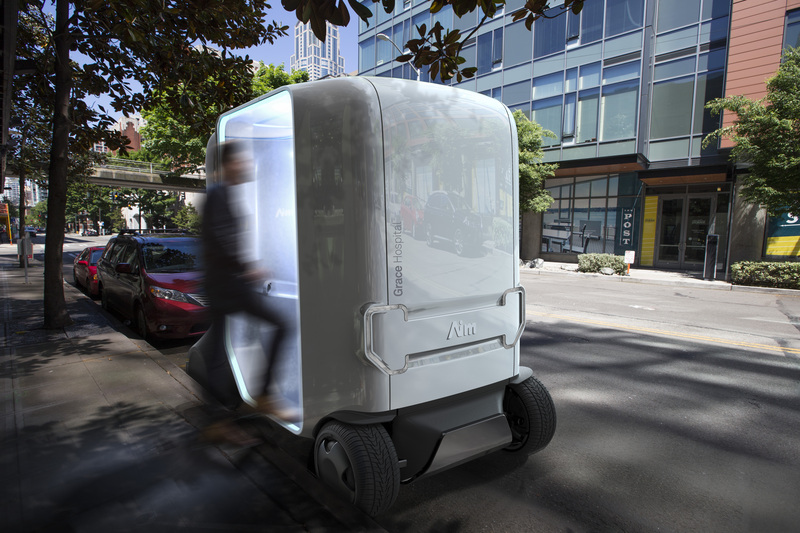 Aim delivers on-demand healthcare via a self-driving clinic. This minimizes the logistical burden on the patients and makes them more likely to engage in their care, before conditions and costs escalate. At the same time, Aim helps clinicians focus on the more complex cases, where higher-value expertise is needed. 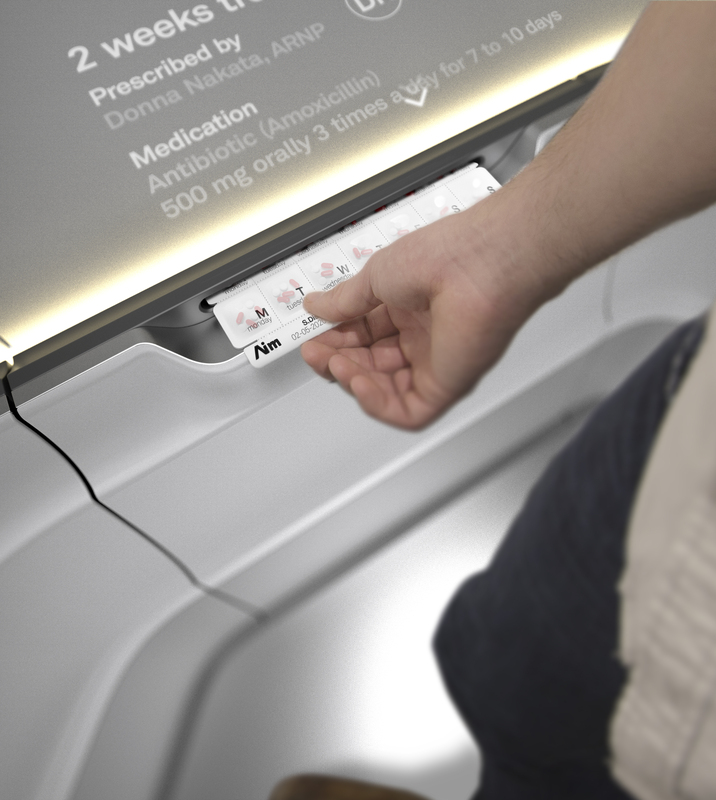 Aim dispenses the most frequently needed pharmaceuticals, like prescription analgesics, antibiotics, or contraceptives. Maintaining a small inventory of the most common drugs removes the logistical burden of picking up new medication from the pharmacy. 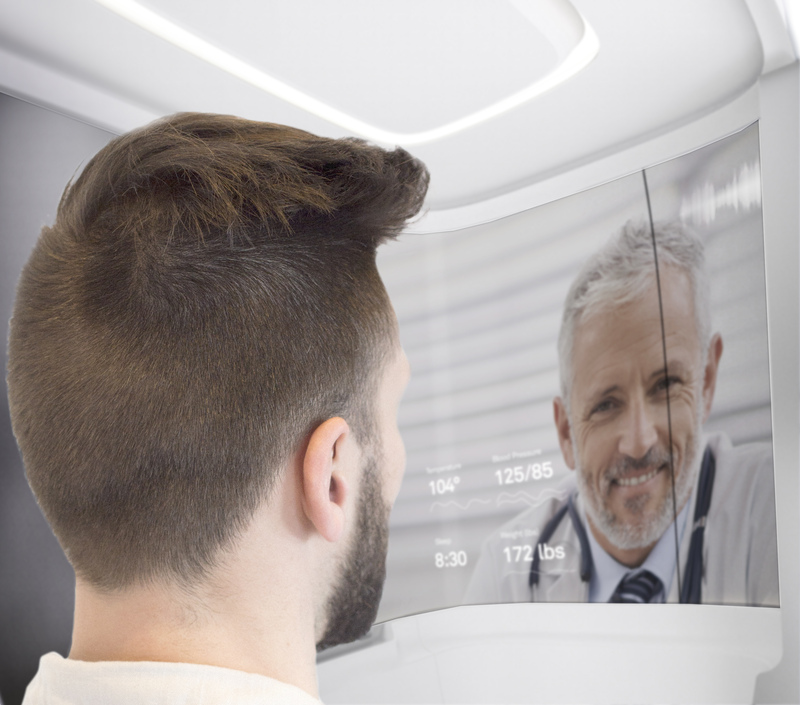 If the self-guided assessment indicates the patient needs to consult a specialist, the Aim platform connects the user to one of the on-call specialists from participating fleet partners. The Aim clinic can also provide immediate transport to the emergency room, reducing the critical time to get the patient into a clinical environment. The healthcare system is complicated, and a huge part of that complexity is caused by incremental, one-dimensional improvements that over time become a burden to the system in terms of effectiveness, experience and cost. Evolving technology, new business models and, above all, people’s growing engagement in their health give us a unique opportunity to aim higher and design a healthcare system that takes into account the intertwined needs and co-dependencies of patients, caregivers and society.